The Ducati Diavel is the second cruiser motorcycle from Ducati, after the Indiana of 1986–1990. The 2011 model year Diavel debuted in November 2010 at the EICMA motorcycle show in Milan. The engine is a retuned version of the 1,198.4 cc (73.13 cu in) Testastretta from the 1198 superbike, now called the Testastretta 11° for its 11° valve overlap (reduced from 41°). 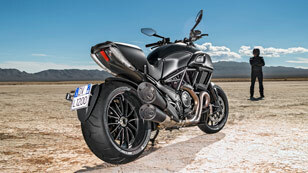 Styling for the Diavel was developed in-house, although the project began under the leadership of Ducati's previous design chief, Pierre Terblanche, who commissioned Glynn Kerr, freelance designer and design columnist for Motorcycle Consumer News, to produce the initial concept sketches. In the US, most Diavel buyers appear to be existing riders age 50 and over, with more women than usual attracted to the bike, and some Harley-Davidson owners, especially V-Rod riders, trading for the new Ducati power cruiser.